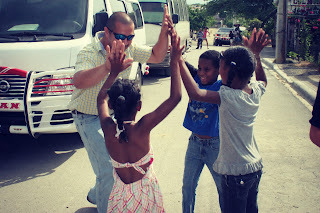 even though i spent the day with my compassion kiddos on thursday with darin and megan...the rest of our group went back to wrap up the time we had in both centers...CWAH and cienfuegos. it was a full day of activity! there was a roof to be completed, more teeth to clean, games to play, Bible to review, school supplies to be given away...not to mention the countless hugs and and goodbyes. THE ROOF IS COMPLETE! the boys did an amazing job...through many bent nails, falls, bumps, bruises, laughter (BBBBBBB!) sweat, and extreme heat...CWAH now have a new roof (without holes)...an example of love and dedication to provide a desperate need. way to go boys...we are so proud of you! the dental team cleaned over 150 sets of teeth...gave away dental packs with toothbrushes, toothpaste, floss and other goodies. 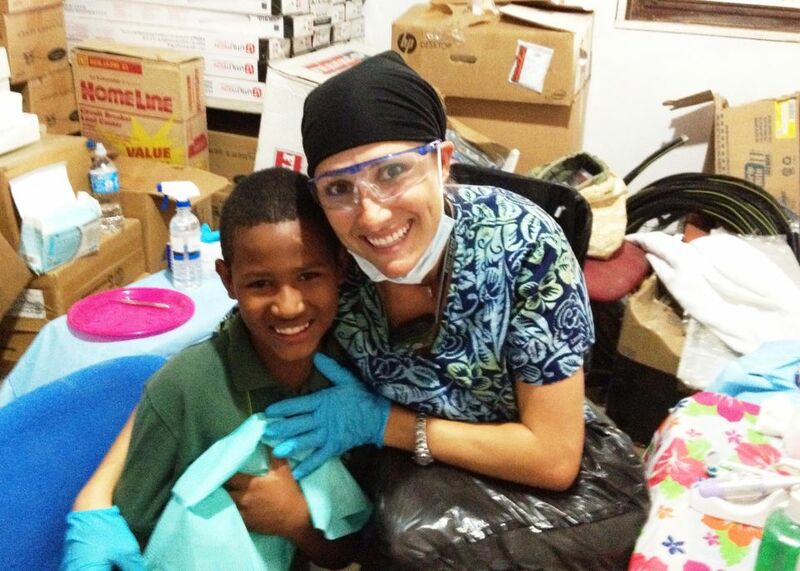 they did their best to educate them and give them hope for dental health! they not only touched their teeth...but touched their hearts as well..."tres mas" (three more) at a time! 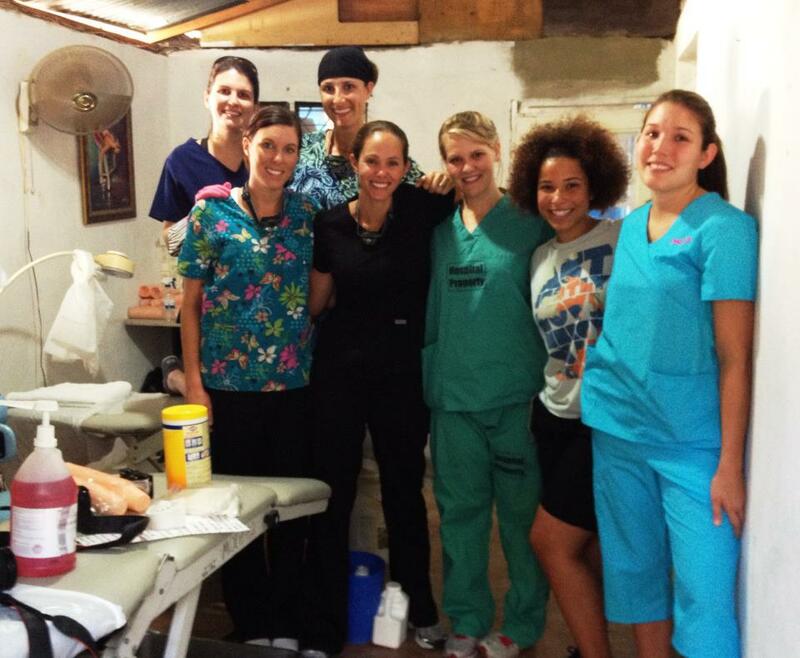 in their very small, very hot and sweaty clinic...they followed what Jesus had called them to do. they even had a chance to go in the streets to pass out spanish Bibles and share the love of Jesus outside the walls of CWAH...God is sooooo good. my "spanish jen"...dulce...(darin calls her carmello abuela..grandma caramel) led Bible review and lesson time for over 3 hours! (needless to say...she gave everything...even her voice!) the children remembered the Bible points and Bible verses and were reminded how much they need Jesus. they need their own relationship with Him. 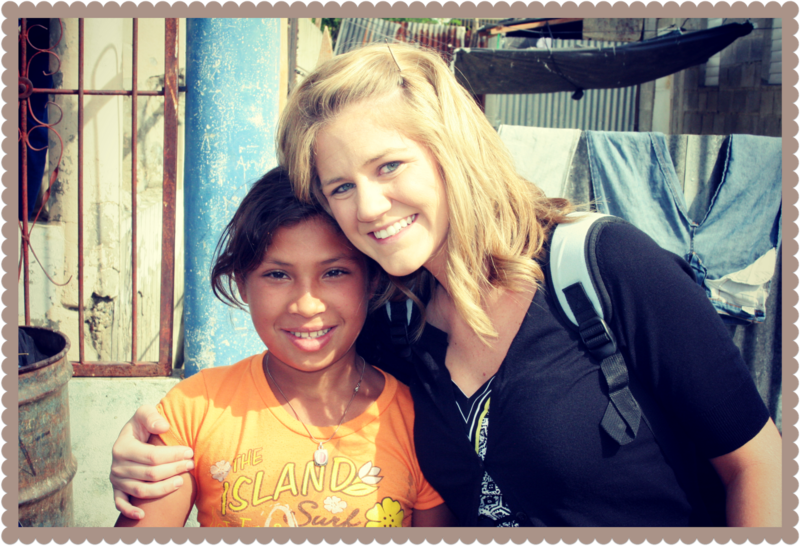 she continued to teach how to follow Him...how to Shine for Jesus everywhere they go. we both loved the older group of kiddos and how much they held on to every word. we encouraged them to be an example for the others...and to believe that God has a plan for each of them. dulce sang with them songs that we taught them...laughed and "excercised for Jesus"...then they blessed her with songs they knew as well. our team played games and cheered...making memories in their heart about the children with a hope...moments in time that are forever a part of all of us. 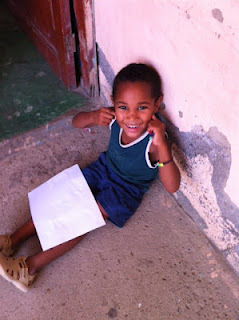 cienfuegos was a tiny place stuffed to capacity with children and excitement. it was difficult as the children would ask, "manana?" (tomorrow?) and the team would answer no, with tears in their eyes. the children here are starving not only for food and water, but for love. the team brought love everyday. they poured out hugs and smiles and prayed for these lives that came searching daily. Cookie told the story of mary at the tomb...sharing the excitement about how Jesus is Alive! 9 more little hearts asked Jesus to be their Savior...a few of our construction boys were able to come and experience this little place...amazed at how the kids welcomed them and wanted them to hold and love them. 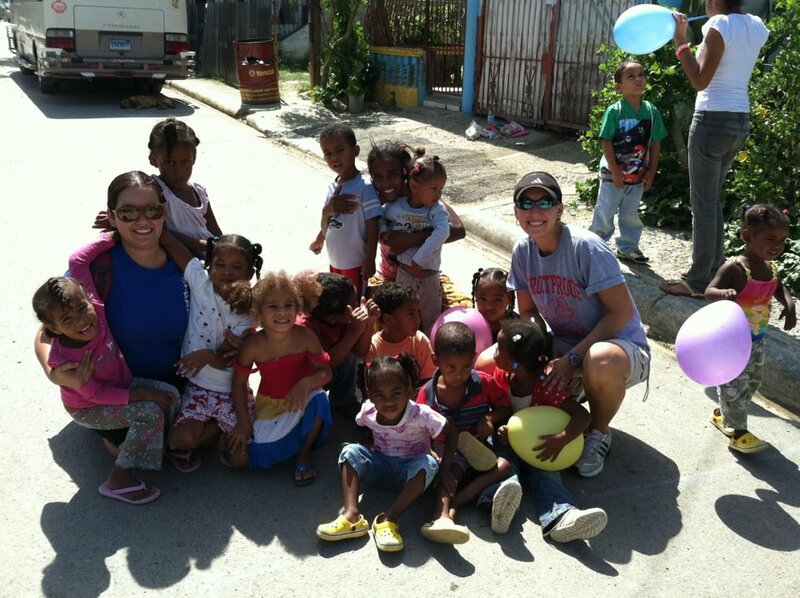 the cienfuegos team were able to bless the children with "prize bags" and school supplies. they could not believe the items were "theirs"...truly belonged to them. they proudly filled their backpacks with treasures to take home and share with their family. and all of us who experienced cienfuegos have treasures to take home in our hearts to share with our families too. 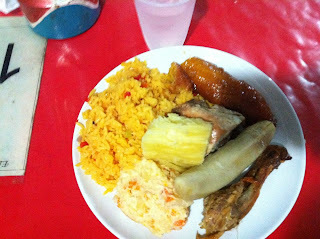 our whole team was invited to a wonderful dinner...a final "dominican style" meal...complete with rice, beans, plantains, meat, eggplant and salad. 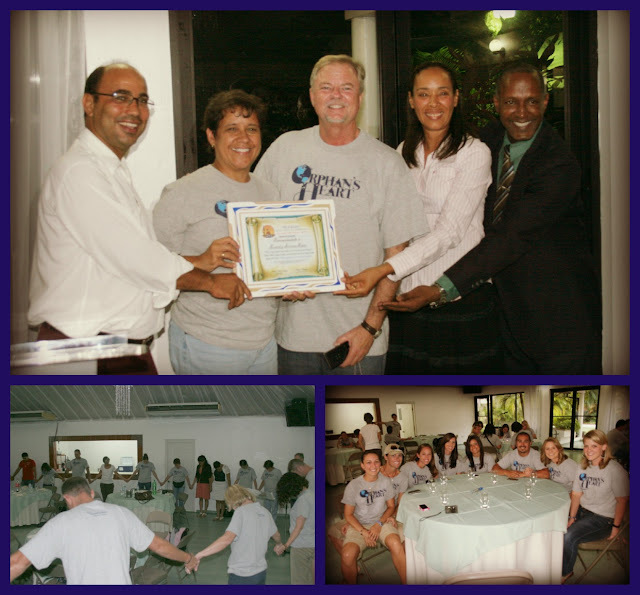 we sat in a beautiful room with new friends from the states and new friends from the DR. we had become a family. all of us. 51 new hearts found Jesus and asked Him to be Lord of their lives...but all of our hearts were different...changed from this amazing experience together. Pastor Pablo and his wife (mi hermana sangre...my blood sister) Elizabeth presented plaques to the leaders of the different projects completed while there...what a nice gift! and their beautiful daughter closed out the evening with an angelic version of "amazing grace" in spanish. we returned to the hotel to pack our bags and rest before our 515am departure. 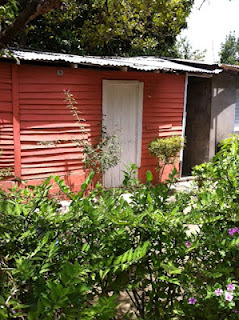 we all came to the Dominican Republic to find what Jesus had in store for us. we knew we would come home different, changed, inspired to live in a new way. we all saw things we had never seen before...things so etched in our hearts and our minds...that even our dreams at night find us there again. but one thing that is common for each of us...one thing that none of us can deny or even explain well...we saw Jesus. we saw Him in the people, the places, each other...we saw Jesus. And when you see Jesus...He changes everything...we will NEVER be the same...and THAT is what we all needed most. my heart is racing with anticipation this morning! i'm preparing the gifts for dismairy (dis-merry) and pavel (pa-bell)...wondering if they are also wondering about me...wondering about the day ahead...it's all so overwhelming! the emotions that grab you and spin you around...i often feel like it is all a dream. darin and i have said how the scenery here, the poverty, the experience...it feels like you are on a movie set...that somehow it really can't be reality, but then it shakes your heart and rattles your very soul that THIS is reality for THEM. 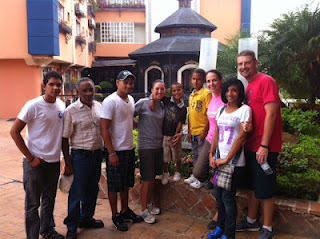 we headed to the compassion center with our new translator friends- johann, cindy, and julio. today we also have a new driver. let's just say we have been very blessed with eduardo and polo, our two drivers for the week. our new driver today...antonio...took us on a ride that i will never forget! i was so relieved when we finally reached our destination...in one piece. :) the center was nice...the older children greeted us and three told their stories of being sponsored and what that has done in their lives...it was beautiful. we also saw the youngest class...they were finger painting and sang a special song for us. then we entered the "office" where three children sat waiting. our children. megan smith was with us to meet hector, her compassion child...a bright smiling, full spirited 6 year old boy! he likes to be called "junior". it was a blessing to watch megan interact with him! i recognized my two sweet children, dismairy and pavel. overwhelming for all of us...i hugged them both and did my best to speak to them. i asked..."es Jesus en su corazon?" (...is Jesus in your heart?) they both shook their head yes and smiled as i told them...me too. 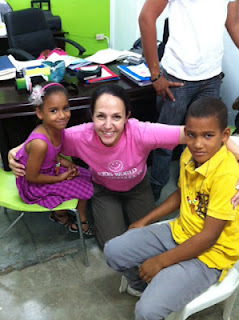 i brought them both a salvation necklace and told each of them the colors and their meaning...in spanish! we hugged again after the last bead...amarillo (yellow) viva en cielo (life in heaven!) my children are so shy and i did my best to help them...we held hands and walked together to tour the center. we left to visit their homes...so unsure of what we were about to see. junior and megan were first. this very happy child lived in a place that i can't even describe (overwhelming)... but his mother and 2 year old brother greeted us with smiles and welcomed us. megan stayed with junior and his family with a translator and we left. pavel smiled as we got close to his house. we arrived and were welcomed inside their home. he sat with his mother as we communicated through a translator. i gave him his gifts...our audience grew...no air, no electricity, no running water...the house filled up with people as pavel (8 years old) showed them his new treasures. we knew pavel loved baseball, but did not own a glove or ball. darin pulled a ball and a brand new glove from his bag...i can't describe that look on his face (overwhelming)...it gave us so much joy to see his reaction...i gave his mother a spanish Bible and told her we would be praying for her family and were honored to be a part of their lives. i hugged her and we were on our way. pavel came with us to dismairy's home (little pink house in pic)...we had to walk thru another home to get to hers...we did not go inside...it would not have been able to accomodate the group we had. her aunt greeted us and we sat in chairs outside...we gave this sweet little girl (she just turned 7 a few weeks ago) her backpack of goodies and she smiled as she pulled out the things i chose for her. she loved her little baby doll and darin asked her what she would name her...she decided on "jenny". i don't know how my tears were able to be held in my heart and not roll down my cheeks...i wanted to hold her like she held that little doll. dismairy, overwhelmed by the entire day, began to cry (a girl after my own heart!) i wiped her tears and held her in my arms telling her i loved her and understood...i gave her to her aunt who held her....i was happy to see the love between them. dismairy chose not to go with us to lunch. it was so much to take in... i hugged her for the last time...and blew kisses as i walked away. overwhelming. we went to a mall and ate together. 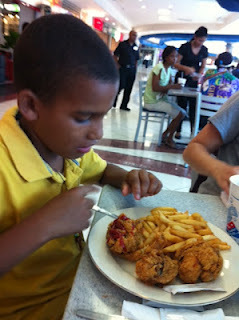 pavel wanted fried chicken...we bought him 3 large pieces with french fries and a coke. he quietly ate every bite. overwhelming. i watched and wondered if that was the largest meal he ever had...if he thought about his family as he ate...how would he describe it all to them? we arrived back at our hotel to say goodbye. i loved this time being able to laugh with him and we took pictures and i taught him how to take a picture with my phone...precious moments. i gave him a big hug and told him i would write and pray...and asked him to hug his mom and thank her for letting him spend the day with me. i gave him a finger light and told him.."brillar por Jesus!" (shine for Jesus!) then we waved as they drove away. overwhelming. their lives here is their ONLY reality. they do not constantly wish for more because so many of them do not know about what is more. they find contentment and peace in what is their reality. we live in the more and somehow find discontentment and unrest. we walk around in a life full of blessings and forget where our blessings come from. i thought my goal was to go and "be Jesus with skin on" to the people He would put in my path. although i know i was faithful to do that...i also found these people...all the faces and lives i came into contact with...they were "Jesus with skin on" to me. they have nothing yet, because of Jesus...they have everything. OVERWHELMING. The DR Mission Team has safely returned home. DR Update - bienvenido a mi familia en Cristo! "I am the LIGHT of the world...whoever follows me will NEVER walk in darkness, but have the light of life!" if we follow...HE is the leader, we are not. 23 sweet little faces who want to follow have decided to let GOD lead. I give GOD all the glory! it was my last day at CWAH. 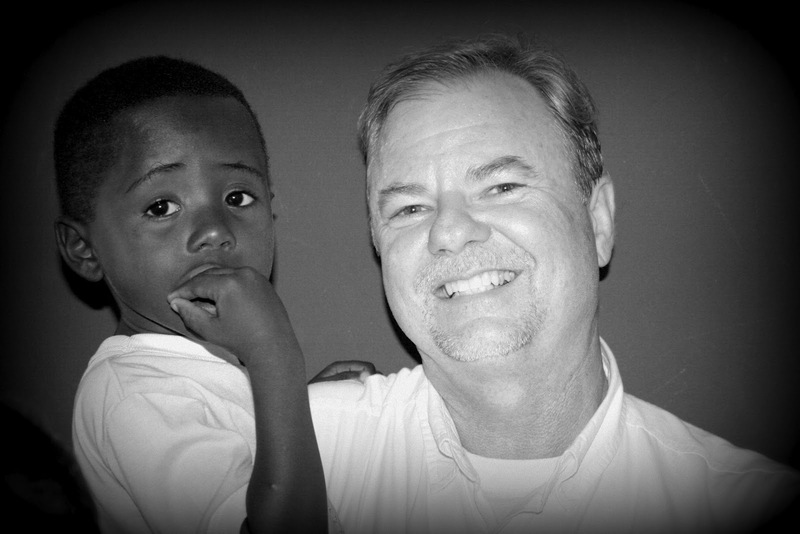 tomorrow i will go to meet my compassion children! :) it was sad to walk through those doors the last time this afternoon. 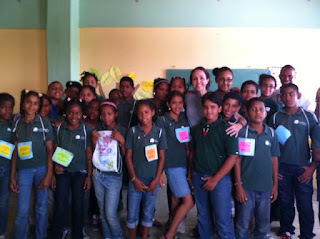 i will pray daily for the center, the people, the kiddos...the dreams and hopes of all who are there! we ended our day at CWAH with the flashlight skit from FCC VBS. We used the espanol version of "oh how He loves us"...we already performed this skit once on Sunday for a church we attended...but without passing out a light to everyone. instead we passed out Bible verse strips of paper ..."the Lord lights up my darkness." and although on Sunday it went great...(Ron was satan, Paul was Jesus and Linda and i danced with the flashlights...) today was so cool. for me anytime kiddos are involved...it's ALWAYS amazing. Ron and Paul were there and Alexis danced for Linda (she was still with CienFuegos). WOW. the children booed satan just like our kids world kids! and when we started passing out lights...they were soooo excited and couldn't wait to have one! i told them "brillar por Cristo!" (Shine for Jesus!) they were all waving their lights...it was beautiful. even through lots of tears, it is a moment that will be crystal clear in my heart forever. the dental team is not just saving teeth...but saving lives! Pastor Jim was able to have a great conversation with Nick, a translator for the team (lives in the DR)...and because of the time Jim spent talking and sharing (and because of God's divine intervention...) Nick also accepted Jesus for the first time! a new hermano (brother)!! YAY!! the boys are almost finished with the roof! they have worked so hard! they are hoping to be completed tomorrow. i can't tell you how much a nail gun would come in handy!! we are proud of the boys...they are kinda bruised and all sport a serious farmers tan...but what they have done will be there for years to come and i'm sure they will never forget it! CienFuegos. the bus pulls near that little tiny gated space and you see children everywhere! today as we pulled up i could hear a few calling "Linda, Linda!"... others were singing...some just chatting away with excitement. They were climbing on the gates, okay, really they were climbing on anything they could! yes, this group has much less structure, much less space, much less of everything...except they had over 100 kiddos! we were blessed today by the children singing songs for us. a sweet little girl "maria"...led the rest of the group. one of the songs i watched a little girl hold her heart and close her eyes...i asked dulce what they were saying. "i love you more than i love my life."...precious. so...if you have been counting...that was 27 new family members. we had 1 yesterday and 13 on sunday. "bienvenido a mi familia en Cristo!" (welcome to my family in Jesus!) 41 people whose lives have been changed forever...of course they aren't the only ones who have been changed this week...those of us on this journey have been changed forever too. Jesus lights up my darkness...Jesus ilumina mi oscuridad. i had the great opportunity to teach to 4 different groups of kids at CWAH. my new amiga, dulce...did an amazing job teaming up with me so i could try to pour some of God's words and His love into their lives. dulce is a fabuloso story teller...and captures the kids attention and keeps them engaged! i have been super blessed that God sent her on this trip...He knew how much i would need her! even with the crazy songs we sang (aerobics for Jesus in the Dominican!! ), hugs we gave, giggles we shared...telling over 200 kids today that GOD has a plan for their lives...looking into the eyes that you know have seen more poverty and pain than ours ever will...IT WAS LIGHT IN THE DARKNESS. the light of Jesus...the hope...the promise...these beautiful kiddos need to know it is for them...all of them. dulce told the story of the blind man being healed by Jesus..healed from the darkness he sat in every day since he was born. a prisoner in his own darkness until the day that Jesus changed everything! Jesus not only healed his eyes...but his heart. we told the kids they could ask Jesus to heal the sin in their heart too. i listened to 4 beautiful prayers by 4 different children as we all put our hand on our hearts and thought about the sin that separates us from God in our own lives. my fcc kiddos raised money to also purchase some glow in the dark bouncy balls...we told the kids it was a reminder of Jesus bringing light to the darkness! they loved them! they clapped and laughed and were so thankful! we showed them how to cup them in their hands and "peek in" to see the glowing light! way to go kids world kids...you were a light for Jesus today in the dominican! i was also able to visit cien fuegos this afternoon. the kids here are very different from CWAH. they come very dirty, some with no shoes, some with the same clothes each day, most with needs that we could never imagine. it is heartbreaking. almost distracting! i just feel myself looking around...praying for all these little faces...watching them...wondering about their stories. most of them came back with their backpacks on...carrying them with great pride to have something of their very own. during crafts they all wanted to take markers home. we gave out a pencil with eraser top and a small pencil sharpener..."para tu en su casa" (for you in your house)...they couldn't wait to have one to put inside their backpack! i did see a couple kids eat markers, couple drew on themselves...but many worked hard to color the cross keychains that they tucked away for safe keeping. :) all the girls there from our team and doing such an amazing job. i can't imagine what it will be like for them to say goodbye! God truly sent us everyone we needed and put them all in the right places! He's so good like that. the dental team amazes me! such hard work! 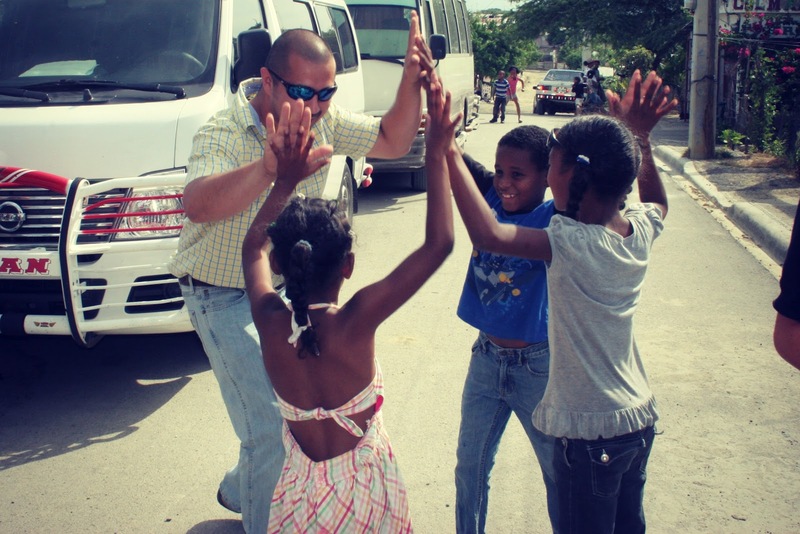 pastor jim runs all over the place picking out the kiddos that "get to go" to the dental clinic! they also carry the dental care bags around like a treasure! 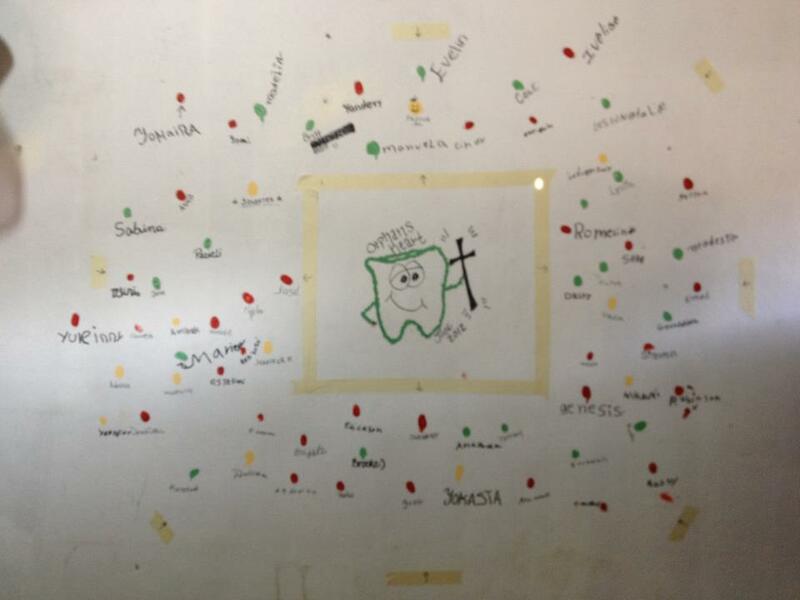 they have been allowing the kids to put their finger print on the wall and sign their name. i drew a cute "happy tooth" (will get a pic!) and the dental team will finish with their handprints as well! great idea and sure brightens up a sad space! 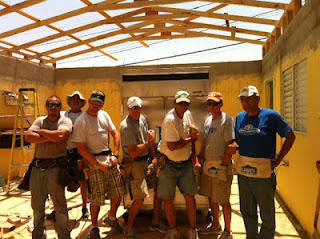 the boys are getting closer in completing the new roof for the kitchen. such hot and tiring work. travis mentioned yesterday how hard it is to hammer in a nail when you know you have a nail gun at home that would finish so much faster! it is almost time for dinner here. i'm guessing rice and beans, with some kind of meat we usually can't identify for sure...it really has been pretty yummy...a blessing indeed! besides...they had some amazing espresso last night for after dinner and we all walked to an ice cream stand for a welcome treat! delicioso! thanks again for praying. my last vbs day is tomorrow...i go to meet my compassion kiddos on thursday! can't believe how fast it is going! don't forget to shine for Jesus wherever you are today. and tell Him thank you for all the blessings in your life.... we have many. DR UPDATE - go team! big day today! our first day of all our official projects! the boys team (minus pastor jim...) all got up early and set off for Children With A Hope to tear down the current roof of the kitchen, build a cement block wall to bring more height to the building and begin trusses for a new roof! their work was definitely super sweaty! they worked so hard and somehow kept smiles on their faces...a few with very sun kissed faces indeed! the dental team and the vbs teams left together for our big journey of "throwing starfish back into the ocean...one by one!" inspired to make a difference "to that ONE"...we prayed our way to both centers for the day. i (jen) went to CWAH first...woohoo! you should have seen all the kids! so many excited happy faces...i used my best "hola's" and many asked me to take their picture. at least 200 kids were all eager to get started with their "special camp"! another VBS team was able to go to Cien Fuegos center...they had over 100 kids total for the morning and afternoon sessions. the girls there were doing an amazing job in this tiny little space with no air! the kids were so sweet and want so much attention...they all love to have their picture taken here and want to see it right away...thank goodness for digital cameras! the dental team was ready and began treating kids and would continue ALL DAY...what troopers! i had the opportunity to watch a few of the team interacting and treating the kids...they were doing a super job..."the sun goes up, the rain comes down, the choo-choo goes around and around!" they were even able to treat a few of the helpers from the center. :) they are all "Shining for Jesus" with clean teeth!! i can't tell you how happy i am to have miss dulce here with me. she is espanol jen! 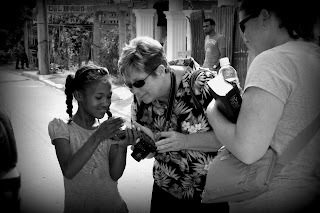 she has a great passion for teaching kids and also is quite animated...and completely speaks their language. she has been a welcome side kick and i know we have quite a few memories to be made together this week. we are changing ALOT of things for tomorrow...flexibility is the key!!! 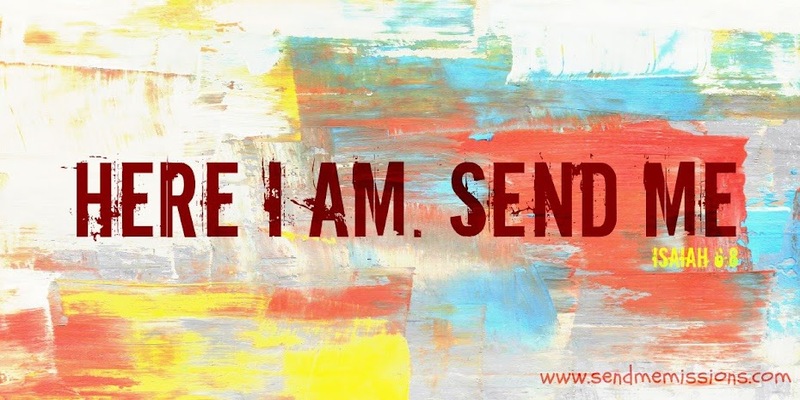 we want it to be the best opportunity to give Jesus to all we come into contact with. although organized planning is ALWAYS helpful...flexible organized planning is the best! our team did an amazing job today...i was so proud of all of them! pouring out your heart, your time, your best hugs...it all matters to them. my kids in kids world will be so happy to see the pictures of the backpacks they raised money for...and the bag tags they made were tied with love by each child to their own backpack! so many people are a part of this trip we are on...and so many of you are praying...we are so grateful. God is protecting us and providing great opportunities for us! *crazy moment today: the dental team was using a pressure cooker to sterilize their instruments used for teeth. it was near the end of the day and many of us were in the common food area. jamie davis samuels was in the little kitchen checking on the pot...we all thought we could smell something strange...she thought maybe the handle was melting??? suddenly...BOOM!!!! the lid of the pressure cooker shot into the air, tossing all the instruments everywhere! i had just looked in there a split second before it happened and saw jamie...we had NO IDEA what had just happened! i asked jamie if she was okay...a quiet and unsure "I'm fine..." came from the kitchen. can't even remember who ran in next...jamie left the kitchen. :) in the kitchen they found instruments all over the place! at least two of them were "driven" into the wood beams above!! the lid of the pot was completely warped and the pot itself was scarred with black stains! with more investigating, we found that jamie WAS fine. God had placed protection around her that very moment. definitely her WOW moment! so, prayer works friends! our God is faithful...i know none of us will ever forget that sound or the moment we realized what had happened. my last blog was more of a personal WOW moment for me...however, i know that so many of you are reading this to find out things we are experiencing while we are here! 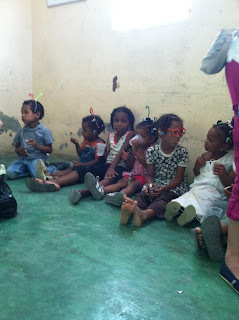 our day started with a trip to the Children With A Hope center...eye opening. i will post pics later...it is late already and i want time to share a little more with you! we joined them for their morning church service...beautiful people came...some with smiles, some who just watched carefully...but all there to worship together. the service was wonderful...jamie and megan performed "testify to love" in sign language (thanks girls-muy bonita! )...Pastor Jim Davis provided the morning message with help from johnathan...our translator...and 3 people came forward to give their hearts to Jesus! we helped the dental team with their supplies so they could set up for tomorrow with the children. 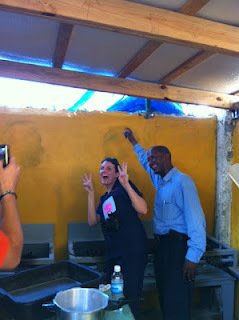 the center truly seems filled with a hope...i love the paintings and the areas created for the children to enjoy! these sweet children are given hope...through Jesus...but also because of Pastor Pablo and his wife Elizabeth who have done an amazing job! Can't wait to get started tomorrow! we also attended a church service at the other center...cien fuegos. if Children With A Hope center is eye opening...cien fuegos is the animated version of eyes popping out of your head and springing back quick! however, these beautiful people were stuffed into a gated carport area complete with energy filled children and a few sleepy dogs. again...the faces. the eyes. the smiles. Pastor Darin (yes, my hubby!) provided the message and Pastor Ruddy translated. And even through a whole lot of sweat...literally...(no fans, no air...just a small breeze now and then) the Lord used his message to bring 10 people to accept Jesus! what a day! but we weren't finished! we were invited to attend one more church service with Pastor Pablo in another area. we gladly accepted! Pastor Jim was able to share his message from the morning service and we sang together and found common ground in our love for God. Cookie was able to bless a young man (one who had just accepted Christ this morning) with his very own Bible...and as megan witnessed...he held it like a treasure...kissing it's cover and lifting his head to thank God for this amazing gift. we ended the evening eating at "patio familia" all together, rejoicing in the day God gave to all of us. yes, we are tired...the food is good, but not familiar...we are all very blessed to have good deodorant...but we are here...and we are all VERY blessed. many of you know that i know very little spanish. 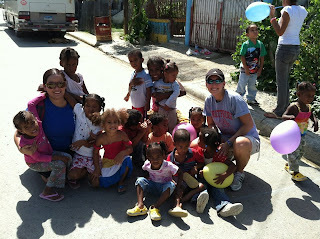 When God challenged me to come to the Dominican and lead VBS...i was concerned about not being able to be "miss jen" with the kids because of the language barrier. i love to teach kids about Jesus...i love to tell stories with passion and enthusiasm...i love to capture their attention and bring them to a place where they fall in love with Jesus and set off on a journey of their own with Him! 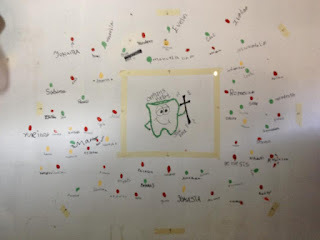 And God was so faithful during the planning, creating, writing stages of VBS for my own church...the same VBS curriculum i would bring to the Dominican. they assured me i would have translators (yay johnathan, dulce and marvina! )...however, i needed to sing the songs in spanish. yikes! in the midst of all that was going on...i needed to take time to learn songs in spanish to sing with these sweet children here. so i googled, sought spanish speakers advice (thank you linda!) and sat in front of youtube reading lyrics and singing along and trying to envision myself dancing and singing with the children. what an adventure this would be. "oh how He loves us" by David Crowder is one of my very favorite songs. during my spanish learning experience on youtube i found the spanish version! it really is one of the most beautiful things i've heard. although the verses proved to be too much for my spanish knowledge...the chorus found it's way into my heart and out of my mouth without any trouble. i tell you all of this because this morning sitting in the church service at Children With A Hope...i knew i was supposed to sing. couldn't deny the burning i felt in my chest...God was asking me to stand up and sing. i politely said no a few times...telling Him surely they already had a plan in place...are you sure, Lord? He was sure. and i knew it! so, i followed His lead and sang "quanto nos ama" with all my heart. and oh how He does love us...all of us. His love is for all languages...His love has no comparison...His love breaks down language barriers and gives us strength that we didn't know was even possible. 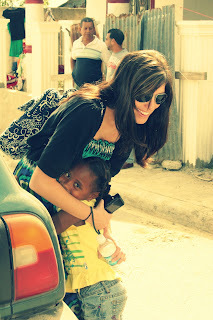 His love pours out from the sweet hugs and laughter of a child...His love finds friendships with people who have just met...His love calls to 13 new hearts in the Dominican, "come follow me"...and they answer. His love is hope, life and the very breath we breathe. His love is who He was, who He is and who He will always be. 13 people came to know the Lord today... How awesome is that?! DR Update posts... coming from The Great, The Mighty, The Miss Jen! After very little sleep the day began "not so bright" (because it was 330am) and early (because it was 330am)...but honestly, i jumped out of bed as darin's alarm started playing "oh how He loves us"...en espanol! What a beautiful language. I did not feel tired, but energized...I stayed up during our sleeping hours packing and repacking our bags in my head...so, once up i did just that, repacked to ensure a good fit and a great day of travel. Out the door and on the way to the airport with our group...excited and ready for what God has in store for all of us! 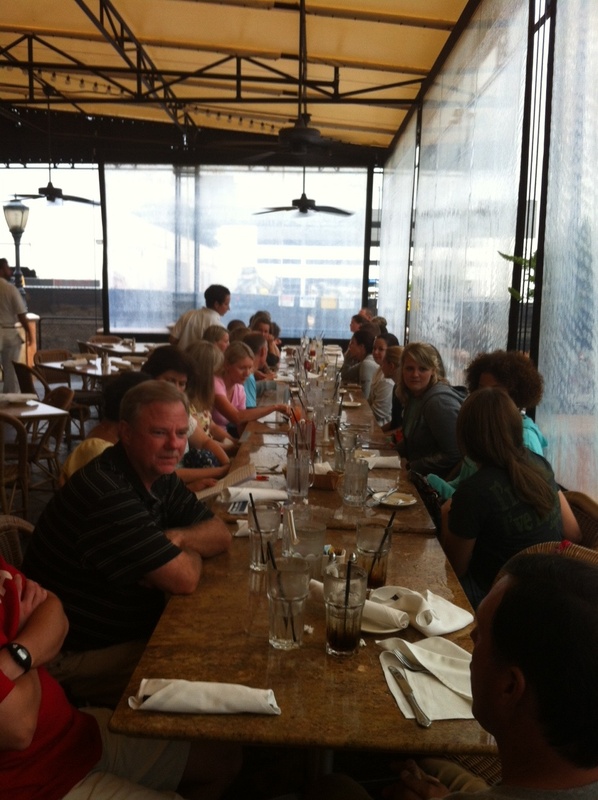 Our hotel is nice...and we all get to eat dinner together. This team that God has brought together...we are getting to know and understand some of the pieces that He knew would be a great fit for the big picture. we have strategized and planned...and prayed, ALOT! i know so many of you have been praying and are praying...please don't' stop. we need you. you are a part of this trip as well.tomorrow will begin early again...but should be brighter! 730am breakfast! can't wait to see both of the centers tomorrow and some of the faces we will connect with throughout the week. i am tired, but i am confident in my God. i know He will give me the rest i need...i know i will never be the same. and i'm truly thankful. no turning back...let's do this thing. GO TEAM! 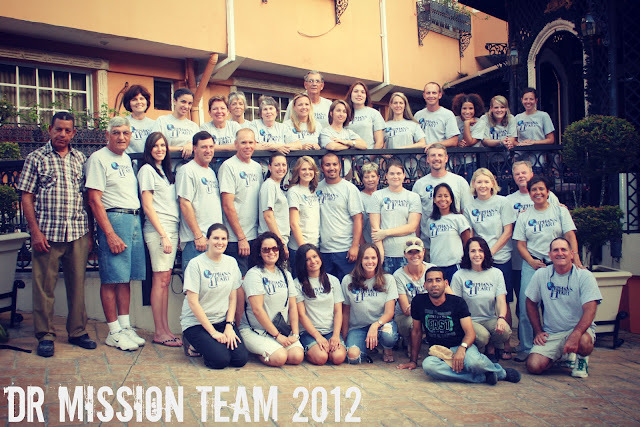 DR Mission Team Update - We're Here! The team has arrived and we've made it to the DR!!! We've got a short time to get ready and head down for dinner. We'll post more this evening. Nicole & Leslie ready to hit the road! And we're ready to go... Hotel Platino here we come! Our entire team has made it to Miami! We had a great dinner with Howie & Marvina at The Cheesecake Factory this evening. We've all headed to bed for a few hours of sleep and then it's off to the Miami Airport at 4:30am. We hope to post upon arriving to the DR tomorrow. The DR Mission Team will be posting updates on our website daily!!! Please continue to pray for our team as we prepare to leave on June 22nd for Miami & June 23rd for the Dominican Republic. Feel free to leave words of encourage for our team and we will be sure to pass them along to the team. So our packing has begun! 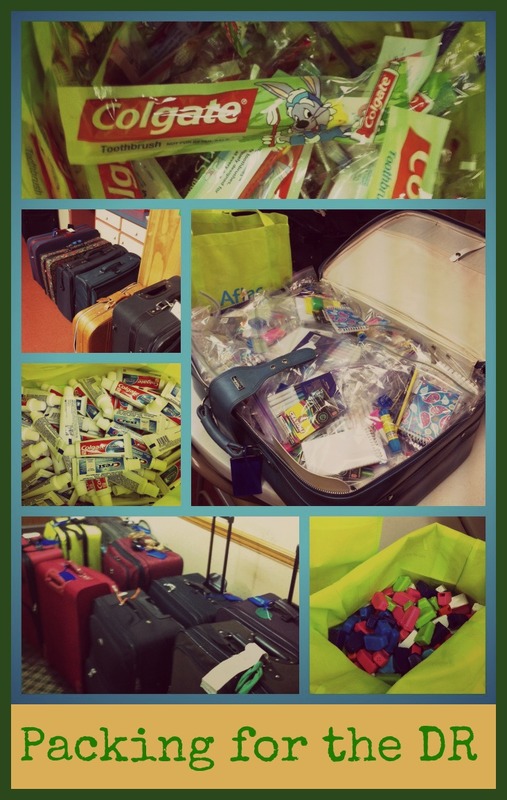 Thanks to the different VBS groups right now at First Christian Church for collecting funds for the Backpacks, Balls & Bracelets and to Oak Grove Baptist Church for the bags & toothbrush covers! Our volunteers have been a huge help in getting these supplies ready to go!